Is there any way to remind me to take the Body Check? You can set a reminder event to remind you. When this Body Check reminder event is triggered, the device gives audio alarm prompt, which will last for one minute if you don’t cancel it manually. BPM supports up to 6 reminder events. When should I take the Body Check measurement? To ensure better tracking of your health status, it is strongly suggested that every Body Check measurement is made under similar conditions. E.g., every morning when you wake up, or every night before going to bed. How many users does BPM support? BPM supports one Guest and 3 configurable users. Should I turn off my BodiMetrics Performance Monitor (BPM) after use? Generally speaking, there is no need to turn off BPM after use. When there is no operation for 2 minutes, BPM will automatically enter a Standby / Calendar mode, which works with ultra-low power consumption. In this mode, BPM displays the data and time. If you already set reminder event(s), BPM can also be used as an alarm clock. If you do want to turn off the device, then press the Home button and hold for 5 seconds. After downloading the BodiMetrics App to your mobile phone. Open the BodiMetrics app on your phone. Go to the second page of icons on your BPM push the BlueTooth icon. The app will sync with your BPM an identify the model number. Please push this box and your data will download into your app. How do I start using my BodiMetrics Performance Monitor? Please refer to quick start guide. Each box contains a BodiMetrics Performance Monitor, a micro USB cable for charging a manual, neck strap and desktop folding stand. How do I clean the BodiMetrics Performance Monitor? Clean your BodiMetric Performance Monitor weekly, carefully swabbing the device surface with a soft cloth or cotton swab with rubbing alcohol. Do not pour alcohol directly on or in your BodiMetrics Performance Monitor. How long does the BodiMetrics Performance Monitor take to charge? With the supplied cable, approximately one hour. How long does the BodiMetrics Performance Monitor battery last? With normal use, 3-5 weeks on a single charge. Your experience may be lower or higher based on your use and environmental conditions. Issue: Device wont charge or turns off immediately after turning on after attempting to charge using your computer’s USB port. Solution: Some laptops and computers shutdown the USB port to save power especially when the lid is closed on a laptop. Plug your charging cable into a wall charger. How does the BodiMetrics Performance Monitor connect to my phone? It uses Low Power Bluetooth, a popular wireless protocol. Can I connect BodiMetrics Performance Monitor to two different Android/iOS devices at the same time? How do I sync my BodiMetrics Performance Monitor’s data with my phone? Enable bluetooth on the BodiMetrics Performance Monitor. If not done so already, enable bluetooth on the iOS/Android device and open the BodiMetrics app and follow on-screen instructions. No. The BodiMetrics Performance Monitor can record 100 records for up to 7 distinct users. That should last most consumers 2 months of intended use. If you don’t sync it and there are too many records already, it will overwrite the oldest records. You can sync it when you get the next opportunity. Syncing allows you to review your historic data and share it with others. Issue: App asks for access to photos. Solution: Some apps use the photo system on your mobile device to take a snapshot of your measurement thus allowing you to email or attach your measurement to a message. Issue: App won’t connect or keeps searching or connecting but doesn’t open. Solution: Reboot (turn off and on) your mobile device this will reset it in the event of a lockup or glitch. This may be due to a clock reset after a long storage or the battery has drained completely. After the first connection with the phone, the date and time will be sync’d. Usually a user will receive a device with some battery power, so the date will be normal, but in some special cases the battery runs out and the clock may reset. To avoid this, a user MUST connect to the mobile app once before the first use. Why the temperature reading measured by BPM is different from what I measured from an infrared ear thermometer? The temperature varies in different part of your body. Even for a healthy person, the temperature difference among different positions could be between 0.2 to 1 °F. Usually, the infrared ear thermometer gives a near-core temperature reading, while BPM gives a reading which is equivalent to the axillary temperature. Why I cannot get the SBP reading when a Body Check is performed? This may happen when there is interference during the measurement. Make sure that you follow the instructions correctly in the Quick User Guide. Also, the “Guest” user cannot get a BP reading. Why the device shows that BP calibration failed? 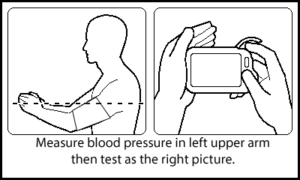 The BP calibration process requires to measure your blood pressure twice. When the difference of systolic blood pressure between two measurements are too big, the BP calibration will fail. Please wait for a few minutes and then try again. 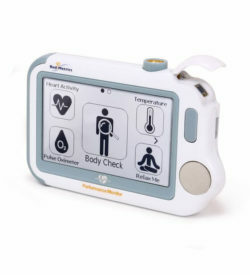 Pick up your Performance Monitor and select <Body Check> on the first menu screen; follow the on screen instructions and hold device as shown below. Note do not forget to place one of the fingers on your RIGHT hand on the silver sensor on the back of device. How often should I perform BP (re)calibration? Please refer to the Quick Start Guide for details. To ensure a high quality calibration, it is recommended that the BP calibration is made with the help of healthcare professional, by using auscultation to get an accurate blood pressure reading from the external BP meter (not included). Should BP calibration be made for each user? Yes. For each individual, the algorithm that computes BP uses factors such as height, weight and numerus artefacts within the waveform. Like a fingerprint, these are unique to each individual. So the BP calibration must be performed for each user. How to perform a Blood Pressure calibration? 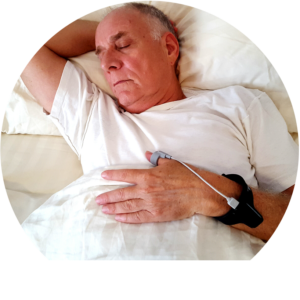 To get blood pressure readings, this device should be calibrated by a you or your doctor with a traditional arm or wrist cuff blood pressure meter (not included). Blood pressure (BP) varies by individual so each User must complete his/her own calibration before using the Performance Monitor <Body Check> function to measure or track your blood pressure. 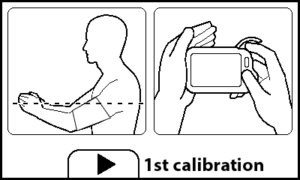 The calibration should be performed when the user is calmly sitting down. To calibrate your Performance Monitor with an arm or wrist-cuff BP meter, follow these steps. NOTE: For initial Set Up, please create a <User Name> under <Settings> on the Second Menu Screen of your Performance Monitor BEFORE beginning the BP calibration of your device. 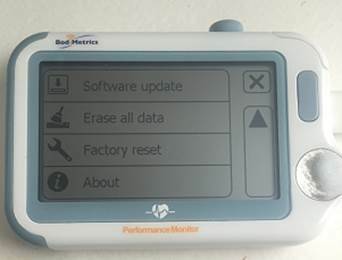 NOTE: BodiMetrics Performance Monitor – Firmware Version 1.6 and greater requires a single BP calibration. Older firmware versions may require 2 calibration steps. 1. First, take your Blood Pressure using an arm band or cuff-based Blood Pressure Monitor (not included) while seated and relaxed. Please write down the reading you displayed on your external Blood Pressure monitor. The Systolic Blood Pressure number is the important number you will need to complete the calibration process on your Performance Monitor. 2. Pick up the Performance Monitor monitor, press Home button to enter Main Screen. Tap the moving arrow on the right to see the Second Screen, and press icon to select. 3. Next, arrow down using the arrow icon on right side of screen and select <SBP Calibration> and then select your <User Name>. 4. With the cuff on your LEFT arm or wrist ensure that the cuff monitor is at heart level as your heart – then START the blood pressure measurement from your arm or cuff BP meter. 5. Now Press anywhere on the 1st calibration screen shown above. 6. At this screen, hold your Performance Monitor in the “Body Check” position with one hand placed on left-side sensor, thumb on front circle sensor, index finger in door on top, and a finger on the rear sensor (back right side). Note do not forget to place one of the fingers on your RIGHT hand on the silver sensor on the back of device. 7. Once you complete the FIRST calibration, the Performance Monitor will request you enter the Systolic Blood Pressure number (TOP NUMBER ON YOUR BLOOD PRESSURE MONITOR). Please enter the number using the Performance Monitor screen keypad, and press OK.
9. Should the BP Calibration fail, please turn off your Performance Monitor by holding down the blue-gray Home button. 10. Turn your Performance Monitor back on by holding down the Home button again and repeat steps above. Can BPM replace a traditional blood pressure meter? No traditional blood pressure meters take both systolic and diastolic blood pressure readings. BPM cannot fully replace a traditional blood pressure meter. However, after calibration, BPM offers a more convenient way to track your blood pressure anywhere and anytime. What conditions may cause inaccurate measurements in measuring SpO2/blood oxygen? Poor blood circulation; Generally speaking, for people with poor blood circulation, one of the indications is, the finger is cold to the touch. In this case, you can rub your finger to increase the circulation, or warm up your finger. Flickering or very bright light shining inside the SpO2 sensor. What are the advantages of BPM ECG function? BPM uses 500Hz sampling rate to capture a high quality ECG waveform; BPM uses wide band width equivalent to medical-grade patient monitors used in hospitals. Why is the ECG waveform not clear and sometimes not stable? Sit down, keep calm and relax. Put hands on table or thigh to relax arms. Hold the device gently and steadily, make sure that your finger and palm have a stabilizing contact with ECG electrodes. Moisten fingers and/or palm to improve conductivity when necessary. Dry skin or thick stratum corneum affects conductivity. Can I use BodiMetrics Performance Monitor during my cardio-training, strength training, yoga or meditation practice? Of course! This also goes for massages or other activities that may relax you OR for exercising optimally. Please consult a physician before beginning any training regimen. Does BodiMetrics Performance Monitor track how much I walk? Yes, the pedometer functions tracks steps, estimated calories, and distance. How does BodiMetrics Performance Monitor measure my EKG/ECG? The heart electrical system products signals that permeates throughout the body. 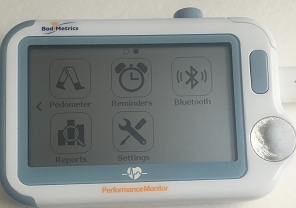 The BodiMetrics Performance Monitor has 3 electrodes that, when used correctly, complete a circuit, that the sensors measure. What can BodiMetrics Performance Monitor track? Can I get BodiMetrics to send me daily/weekly summaries? Will BodiMetrics ever sell my data? Can I cancel my order? How do I return or get a refund? We’re human too! We understand that things happen. If you’re not satisfied with your purchase of BodiMetrics Performance Monitor, you can return it for a full refund in the first 30 days. Just contact us with your order number. If it isn’t too personal, we would love to know why? We’re always trying to improve! Yes! You will see the additional shipping fees (if any) on the order page. How do I check the firmware version on the product? 1. Go to “Home” page and then click on the right arrow. Tap the “Settings” menu item. 2. Scroll down the page and tap “About”. 3. The “Software Version” listed is your firmware version. The following process will update the software on your BodiMetrics Performance Monitor. Contact Customer Support at 844-744-8800, option 2 if you need assistance. If your BodiMetrics Performance Monitor firmware is already version 1.6 or greater you can update your firmware with your smartphone BodiMetrics mobile app under Main Menu -> Device Update. 2. Windows ONLY – Click on this link in the email to run the update program. When you click on the file you will see a small window asking you to save it. Click Save file. It will be saved to your Download folder. Otherwise go to your download folder and click it there. 3. Plug the small end of the white USB data cable that came with your Performance Monitor into the unit. 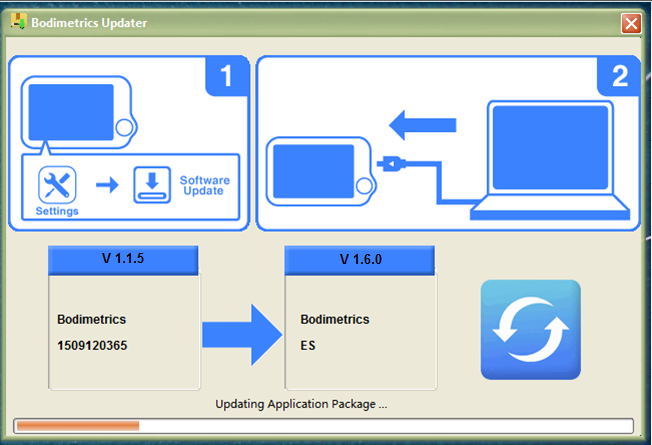 Your BodiMetrics Performance Monitor software update is now complete. You can check the software version under Setting -> About on your device. Is there support planned for Windows Phone? Does my iOS/Android device need to be on Wifi to sync with BodiMetrics products? No. It uses Bluetooth so as long as that exists, you can sync. Is there any way I can create an App with connectivity to BodiMetrics products? Possibly. Please contact us with your use case. Is there a public API I can access the data from? Not right now. Please contact us with your use case. I’m an investor/PR firm trying to feel you out. Please contact us with some specifics of what you are looking for. I want to do business with you. Who should I talk to? Can I get a job at BodiMetrics? We welcome engineers and data scientists to apply.